Looking for a place to enjoy the sun without having to go out of town? Make your way to the Cooley Law School Stadium for Thirsty Thursday with the Lansing Lugnuts, and enjoy $2 beer and soda specials. I was wishing that it was only for a dollar like it used to, but it’s hard to complain when our tickets were free courtesy of Barnes Aerospace (no relation to us). That was $12 a piece and Kyle got eight tickets in all. 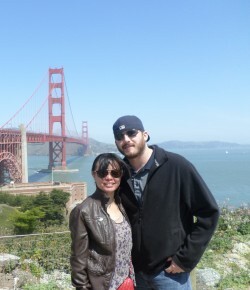 We gave away half to his friend’s family of four and another pair to his brother, Josh. 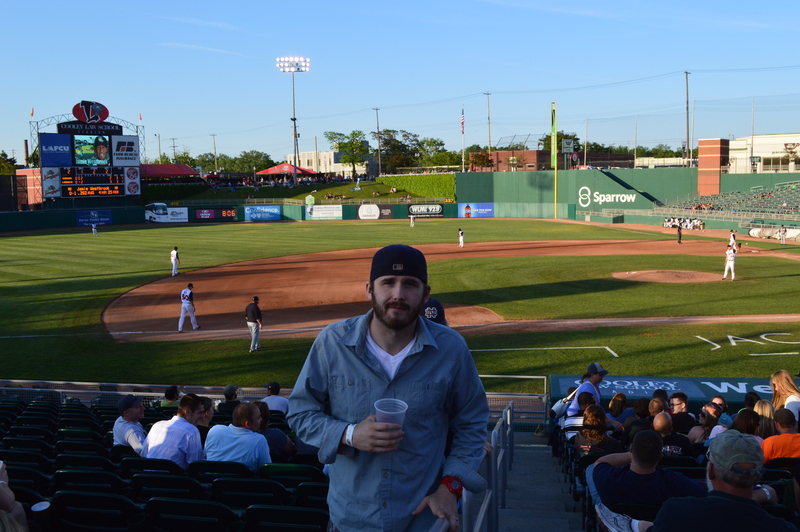 The Lansing Lugnuts is a minor league baseball team here, and since I’m not really into baseball and most especially the minor leagues, I did not know what was going on at the game half the time. And it’s not a popular sport in the Philippines or in Singapore, so what I know about baseball could just be based on Tom Hanks’ A League of Their Own–which really isn’t saying much. 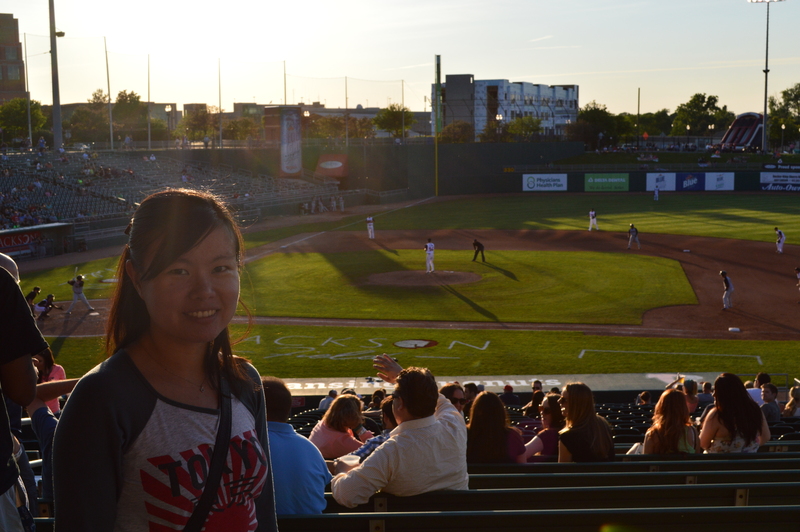 The Cooley Law School Stadium in the heart of downtown Lansing is the home field of the Lansing Lugnuts. Concerts and beer fests have been held at this stadium but it was my first time there. Naturally, it isn’t as big as the Comerica Park in Detroit, where the major league teams I’m more familiar with play (Detroit Tigers, Boston Red Sox, New York Yankees). Food kiosks are lined up on the lobby, and they offer snacks that I had pretty much envisioned from the movies I’ve seen–popcorn, hotdog, pizza, PEANUTS. The guy sitting next to us had broken peanut shells all over his feet; he totally embraced the baseball fan stereotype. Besides the tickets, we also got a free $5 gift card (whoopee!) so Daddy Kyle let me choose any snack I want and this was what my eyes and nose brought me–Steakadelphia. It might have been my first time to try a melt-in-your-mouth Philly cheese steak sandwich. Needless to say, I now have one new recipe to try! 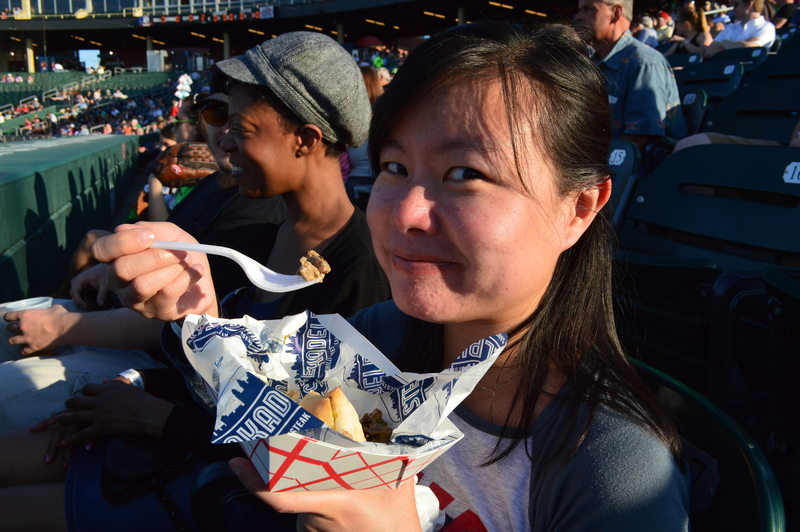 That’s me enjoying my Philly steak. And yes, I use a fork to eat a sandwich. We actually had pretty good seats right at the first row and right behind the dugout, or a team’s bench area. 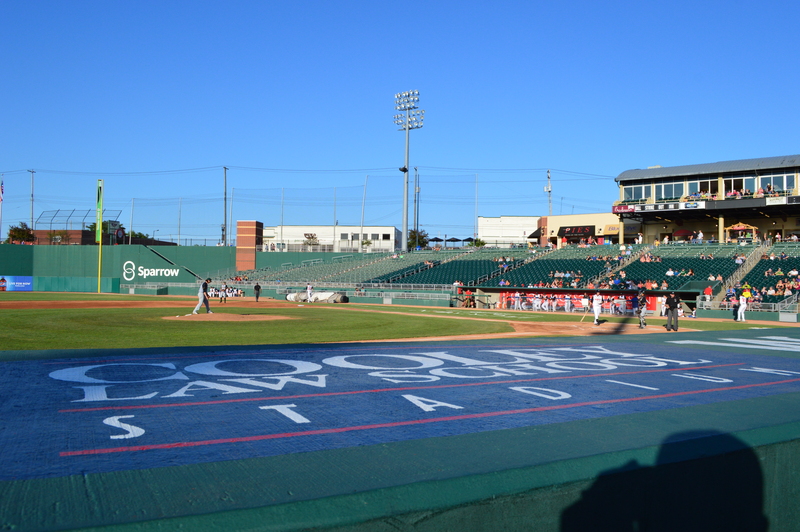 This dugout, however, was not for the Lugnuts but for the team they were playing against, the South Bend Silver Hawks from Indiana. Who won the game? Well, the game ended 13-5 so you can basically picture how bad the Lugnuts were. Anyway, no one was really there for the game. People cheered for the home team but it was really more for socializing, hanging out, and drinking. If it were the Detroit Tigers playing, now that would have been a different story. Halftime meant pep rally time, and cheerleaders threw a few souvenirs to the crowd to hype them up. To actually get a toy thrown at you, you have to be a desperate Lugnuts fan or a kid with a mitten waving at them nonstop. No miracles for me. It’s been more than a month since that Thirsty Thursday game, but I could still remember that day like it was yesterday. We were still barely getting out of the chilly temperatures on the first week of June, and having to spend a sunny day like this outdoors was incredible. Baseball still isn’t the game for me, but I happen to like watching it live. It’s not like basketball that you have to watch every second to make sure you don’t miss anything. Baseball is more laid-back (for a spectator) and it opens up opportunities to observe the crowd once in a while, walk around the lobby, and just to kick back and enjoy a wonderful weather. Update (July 25, 2014): My blog got recognized! Thanks to Mr. Jesse Goldberg-Strassler, a Lansing Lugnuts broadcaster and author of The Baseball Thesaurus.